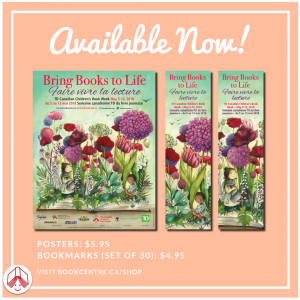 The Canadian Children’s Book Centre has created celebratory posters and bookmarks that schools and libraries can purchase to further enhance theirBook Week activities.This year’s beautiful poster was made by illustrator Gabrielle Grimard. Posters and bookmarks can be purchased at the CCBC shop and are $5.95 per poster and $4.95 for a set of 30 bookmarks. If your classroom or library has a creator visiting you for Book Week, you will receive a complimentary poster. Our free online theme guide will feature the newest books by the 27 touring authors and illustrators and introduce readers to the three touring storytellers. Books will be searchable by name and grade, and will include a description of the book, as well as links to teacher guides and activities, if available.